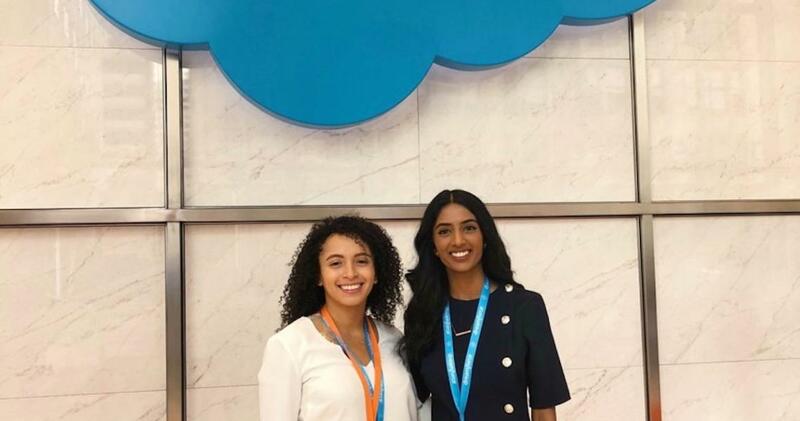 MTSM students Shravanthi Budhi (right) and Rosa Moss (left) join Salesforce at its 2018 Dreamforce conference. Salesforce recently hosted its 15th annual Dreamforce conference in San Francisco, Calif., Sept. 24-28, 2018, aimed to provide students, business leaders and technology experts with an opportunity to come together and educate themselves through many exciting sessions, keynotes and expo centers. What started with 1,300 attendees at the first Dreamforce in 2003 now had over 160,000 attendees participating all-around San Francisco. Martin Tuchman School of Management at NJIT sent its best and brightest Salesforce student leaders, Shravanthi Budhi and Rosa Moss, to represent the college and present at the Dreamforce conference. Budhi and Moss, both Salesforce Rangers on Trailhead, the platform’s online tutorial, had the opportunity to meet numerous community group leaders and student leaders from all over the country. They also explored the Campground, an expo center featuring various Trailblazing customers and partners, and had an immersive experience learning more about how the company empowers Salesforce users to transform the way they do business, with hands-on access to demos on its Marketing Cloud, Community Cloud, Einstein Analytics applications and more. The two student leaders were able to meet with many partner companies as well, in order to initiate new opportunities for NJIT’s Salesforce Student Group. Moss spoke about her experience with the Salesforce community this past summer at the “Be an Equality Multiplier” session, along with Sandi Zellner, assistant vice president and Salesforce product manager at ConnectOne Bank, and Salesforce employees Marcus Stevenson and Brigid Warmerdam. The NJIT Salesforce Student Group, a student-run organization, was established September 2017, and has grown very quickly in its efforts to empower and educate NJIT students about Salesforce and its partner ecosystem. The group was part of an initial pilot program launched by the Trailhead for Students team at Salesforce, and now holds professional events throughout the semester to provide students with an avenue to learn more about the CRM platform and listen to industry experts share their journey at Salesforce. Student leaders and faculty host other events, such as information sessions, boot camps, career panels and more, to offer students additional resources and tools in preparation for entering their desired fields after graduation.